Experience the newest way to cruise Alaska aboard Norwegian Bliss.The new ship is designed with features and amenities to offer guests the ultimate Alaska cruising experience. 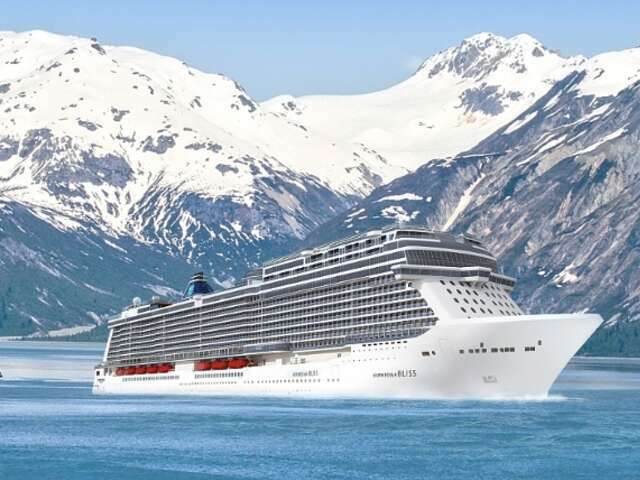 Norwegian Cruise Lines has announced that they will launch a cruise ship specifically designed for Alaska cruising. How exciting. The new ship is scheduled to set sail in 2018 and will be called the Norwegian Bliss. This will be the third Breakaway Plus class ship from the cruise line. The homeport will be in Seattle for the start of the Summer 2018 cruise season. The ship will be the ultimate vessel for Alaska with hull art designed by marine mammal conservationist Wyland. The hull art will be revealed later in October. The Norwegian Bliss will have custom built features and amenities specifically designed for the ultimate Alaska cruise experience. The new ship will sail weekly seven-day Alaska cruises each Saturday from Pier 66 in Seattle, offering guests a premier way to see America’s last frontier and some of Canada’s West Coast highlights, while also providing all of the innovative features, entertainment, signature dining and onboard experiences that Norwegian Cruise Line is known for around the globe. The ship’s itinerary will feature calls in Ketchikan, Juneau, Skagway and Victoria, British Columbia, along with scenic glacier cruising. Reservations for bookings on Norwegian Bliss will open in January 2017. Give your UNIGLOBE Travel expert a call to learn more.